As I wrote in an issue of MacStories Weekly (exclusive to Club MacStories members), I recently moved my Club-related notes from the Apple Notes app to Trello. Because Club MacStories is a collaborative effort, it made sense to use Trello's project management features to let the entire MacStories team see my notes. However, moving those notes to Trello considerably decreased my usage of Apple Notes, which left me wondering if it was time to consider an alternative app for my personal note-taking needs. I praised Apple Notes numerous times since its relaunch on iOS 9. I believe Notes and Safari are Apple's two best iOS apps, and I recommend Notes to anyone planning a switch from Evernote or OneNote. Notes is surprisingly advanced and fast; its iCloud sync is reliable; it even received support for collaboration in iOS 10. I've used Notes as my only note-taking app for over a year now. After moving my most frequently accessed notes to Trello1, I looked at what was left in Notes, and I realized that I wanted to see if a different app could fill the gaps Apple didn't address. For everything Notes gets right, there are several limitations that have required me to change how I work: Notes has no native Markdown support, no automation features, and its organization system based on folders could use a revamp. I accepted Notes' shortcomings because I had no other choice; could a new app lure me away from it through the promise of features Apple would never ship? My transition from Notes to Trello couldn't have come at a better time. I've been keeping an eye on Bear, a new note-taking app developed by Italian studio Shiny Frog, for the entire summer. 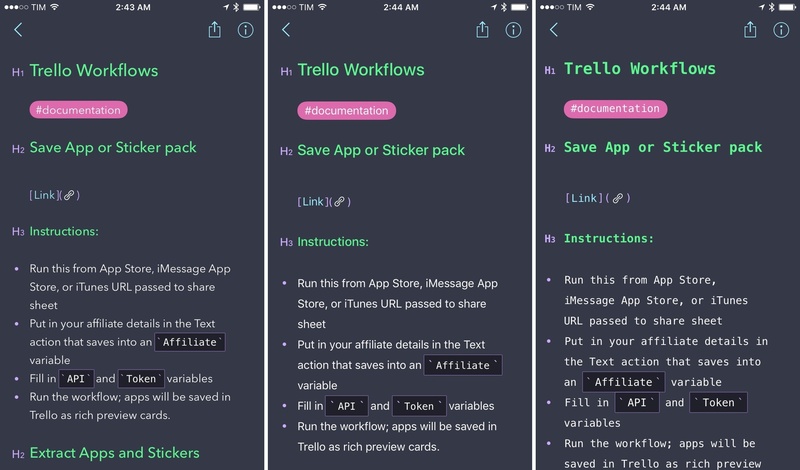 Bear piqued my interest right away: like Notes, it was based on CloudKit sync, but Bear also strived to augment the experience for "online writers" thanks to Markdown, automation features, themes, tags, cross-reference links, and more. As Bear betas went out to testers, I told myself I wouldn't need it because I was perfectly fine in Notes. But when I noticed that I was using Notes less frequently anyway, I took the plunge, moved my remaining personal notes to Bear, and put the app on my Home screen. This happened two weeks ago. I'm still not convinced Bear is the note-taking app I want to use throughout 2017. I didn't have enough time to test the final beta of Bear, and I believe a note-taking app is best evaluated over a few months of usage. At the same time, Bear is full of interesting ideas, and it has the potential to replace Notes for many iOS users who have been waiting for this kind of rich Markdown note-taking app. Bear has some issues, but it also opens new possibilities for Markdown writers and people who work primarily from iOS and aren't completely satisfied with Notes and other note-taking apps. I'm considering Bear as a replacement for Notes, but this is not a definitive review. Instead, I want to lay out the reasons why Bear is superior to Notes as well as the features it's missing. I'm still figuring out if Bear is worth committing to, but I'm intrigued by the app, and there's a lot to unpack. Bear was clearly built with a lot of care, and it shows. The app has powerful functionalities that make it a strong competitor to Apple Notes on iOS. 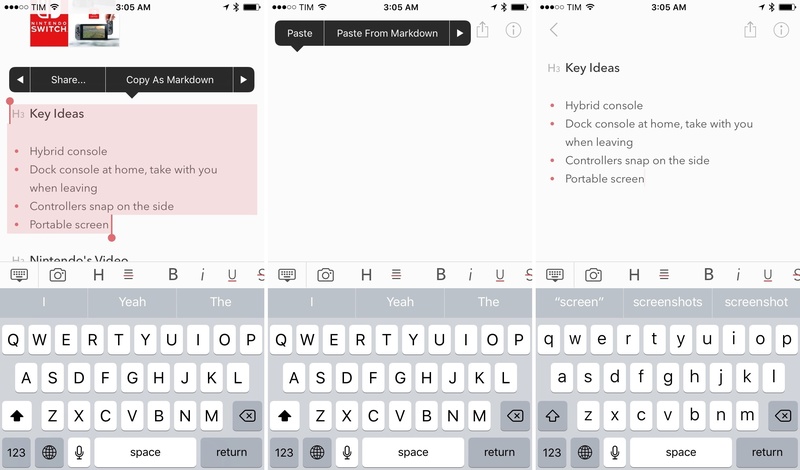 I love Markdown, and Bear brings rich Markdown editing and export to a lightweight note-taking app that feels like a mix of Apple Notes and Drafts. Like Apple's app, notes can be formatted with headers and lists, but Bear allows you to enter that syntax quickly with Markdown, which is then rendered to a beautiful inline preview. For instance, you can enter a new section title by typing ## Title as you normally would in Markdown, but as soon as you type the two pound signs, Bear will convert them to a label that says 'H2', indicating the type of title you entered. You can even tap on the header afterwards to change it without having to type in Markdown again. Other editing features that require too many taps in Notes, such as lists or basic text formatting, can be sped up with Markdown in Bear. Typing an asterisk will start a new list; enclosing text in forward-slashes and asterisks will make it italic and bold, respectively. If you're a Markdown user, you might be wondering if I made an error above – I didn't. By default, Bear uses its own flavor of Markdown that is slightly different from John Gruber's original version. Fortunately, there is a Markdown compatibility mode in Bear's settings that makes the editor accept standard Markdown syntax. I turned this on immediately. 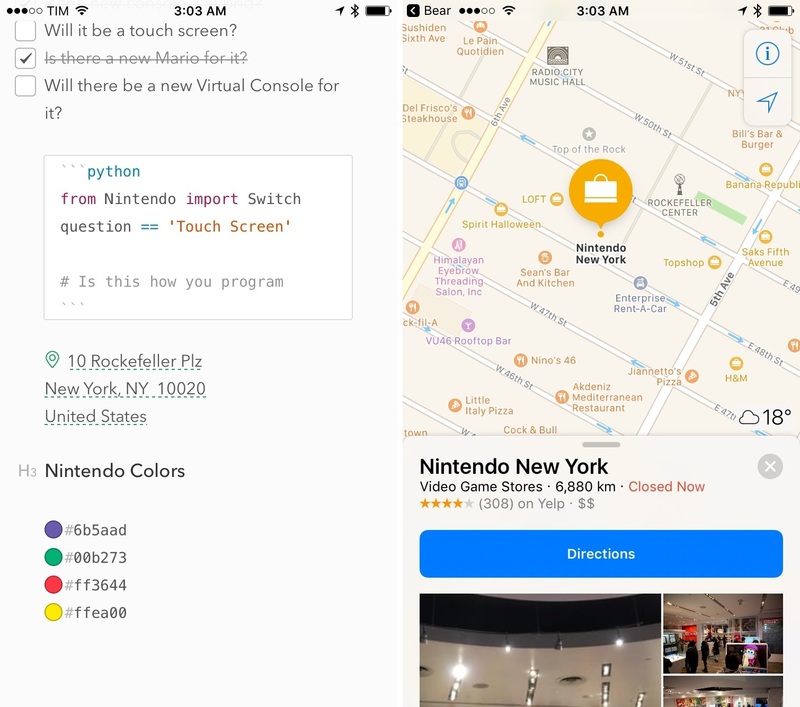 Markdown support extends to other common editing controls: a Markdown inline link is automatically converted into a rich link; you can tap the link's anchor to open a popup for changing the link's title and text. If you go back and edit that link by hitting backspace, it'll be converted to regular plain text Markdown again. 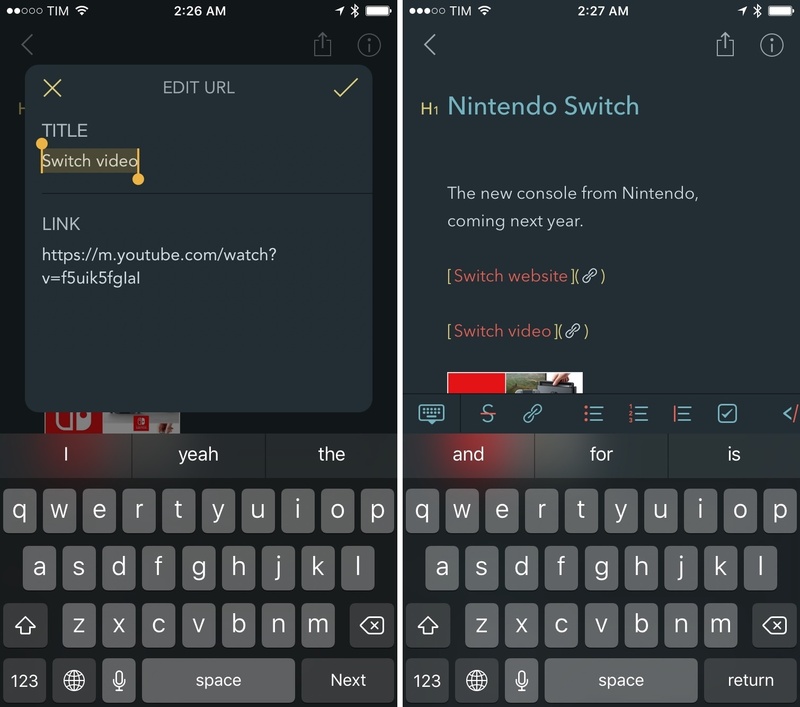 Bear lets you format the title and URL parts of a link separately. The same is true for checkboxes, inline code snippets, and other Markdown niceties that Bear supports and previews inline – something I'd never expect Apple to roll into Notes. Various Markdown and rich text features as reimagined by Bear. Unlike other Markdown note-taking apps, which exclusively deal with plain text, Bear supports inline images, too. From this standpoint, the app is more similar to Apple Notes: images can be visualized inline as full previews or smaller thumbnails2, and you can also import any attachment supported by Quick Look (PDFs, .zip archives, text files, videos, etc.) and drop it in a note thanks to document providers. Bear offers a unique take on Markdown that is both visually appealing and functional. In addition to simply looking nice, Markdown editing means I can format notes and give them structure faster than Apple Notes. I can start a note in Bear and add sections and a few lists without having to tap through multiple menus over and over. Bear offers a unique take on Markdown that is both visually appealing and functional. Bear strikes a good balance of fast Markdown editing and rich text presentation. Effectively, Bear offers an "augmented Markdown" editing environment that employs plain text for quick editing, but relies on rich text and a Notes-like model for everything else. I think it works well. Bear doesn't have folders. To organize notes, you add tags anywhere in the body of a note as #hashtags, which are parsed and highlighted by Bear. Any note can have an arbitrary number of tags, which grants more flexibility than having to choose a single destination folder. Also, tags can be combined for deeper organization by inserting them together, such as #articles #blog; in the tags sidebar, you'll have expandable menus to view notes that have been assigned both tags. I find tags to suit my needs better than folders. I often take notes that belong to multiple areas of responsibility or, more generally, I want to organize my notes and personal archive with fine-grained control. Bear makes it easy, for example, to organize my health records by type and year, as well as my articles by project and website. While I like the way Bear displays tags in a Slack-like dark sidebar, I wish I didn't have to enter tags as hashtags in the middle of a note's text. I have been entering tags at the bottom of my notes so they stay out of my view, but I'd prefer to be able to assign tags in the information sidebar available on the right – it seems like there would be plenty of space available there. I'm a fan of tags to organize my notes as they bring a little extra versatility I find convenient. I'm even more of a fan of pinned notes, though. This feature lets you pin a note to the top of the list so it's easier to retrieve than others. I've been using pins to quickly reach notes for articles I'm currently working on, and I feel like they'll come in handy when traveling as well. 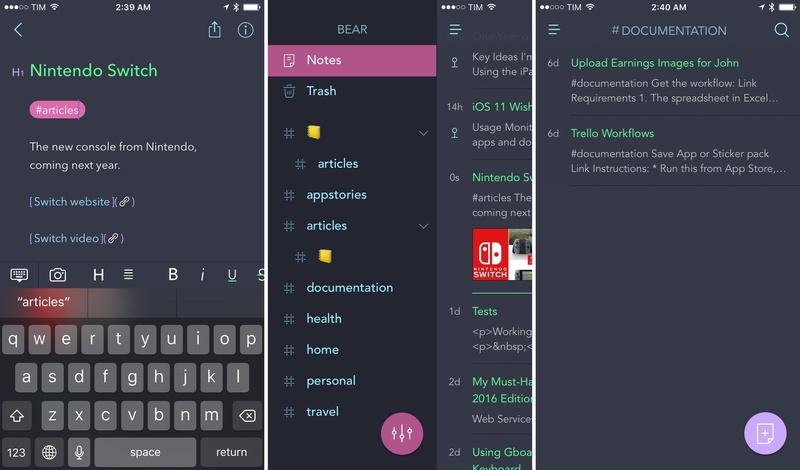 Overall, the combination of tags and pins gives Bear an edge over Notes in terms of organization, which is good to have when amassing multiple types of content in a single app. 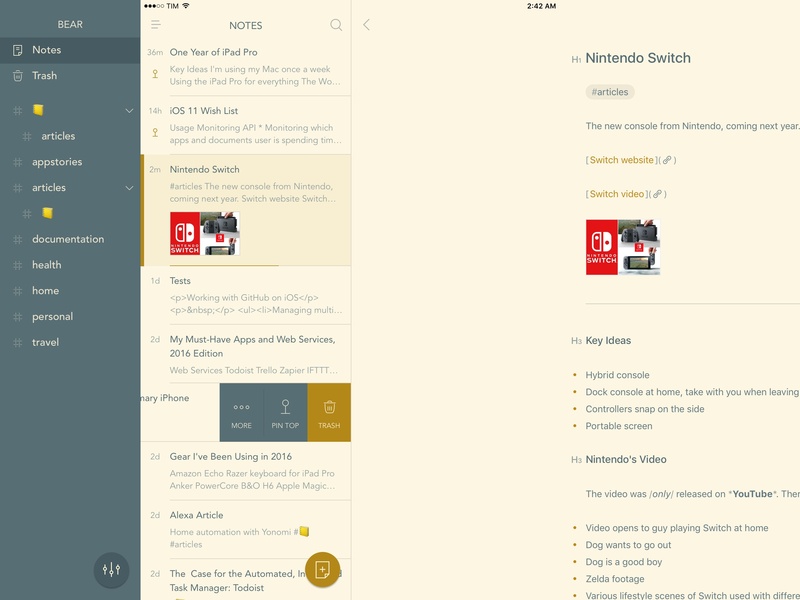 I don't usually give much importance to the appearance of a note-taking app, but Bear's interface looks clean and does away with the remnant bits of paper textures and embossed lettering of Apple Notes. There are some key interface elements to learn in the app – the left sidebar to navigate tags, the scrollable keyboard row for access to common formatting controls, and popovers used to edit items such as headers and links. New notes are created by hitting a '+' button in the bottom right corner of the app, which I find easy to access on large displays. Bear's UI has been designed to not interfere with content, and there are subtle touches I appreciate throughout the app. On the iPad, the chevron icon in the top left has a delightful transition when switching from list to reading a note. In the Settings, you can adjust typography for the editor choosing from four fonts (System, Avenir Next, Helvetica Neue, Menlo), plus options for size, line height, line width, and paragraph spacing. Avenir Next, San Francisco, and Menlo in Bear. The ability to choose a theme is another advantage Bear has over Notes. Shiny Frog built 9 themes into the app, ranging from the default Red Graphite (a white UI with black and red accents) to the dark Charcoal and the retro-looking Panic Mode, plus the omnipresent Solarized Light and Dark. If you're into dark themes and interfaces that aren't white, Bear has most certainly something to offer. 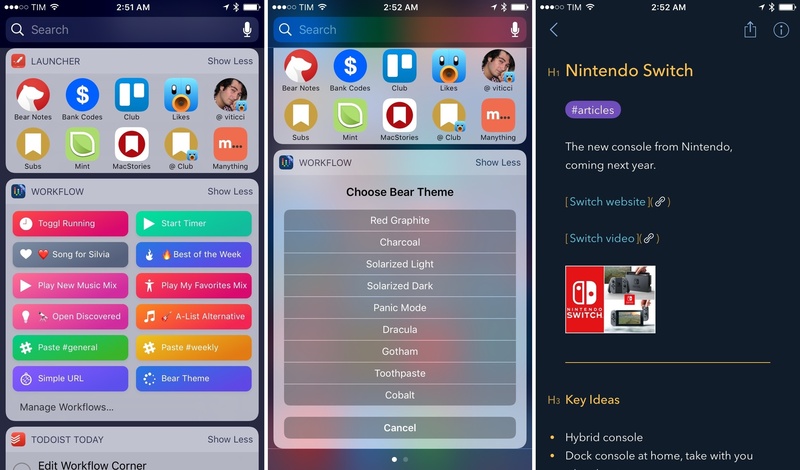 Bear is based on the same CloudKit storage and syncing technology used by Apple Notes and adopted by dozens of iOS productivity apps over the past year. In my experience, CloudKit-powered iCloud sync has been fast, reliable, and, best of all, it doesn't require any manual adjustment. Your Bear notes will propagate across the iPhone, iPad, and Mac (Bear also has a Mac counterpart) in seconds thanks to CloudKit. It's a small detail, but I like how Bear makes iCloud sync less invisible than Apple's apps by indicating where the last editing session took place. In the information panel (accessed by tapping the 'i' button in the top right corner of a note), you'll find a 'Last Editing Device' field underneath statistics for the current note. Seeing which device synced the last edit is useful to confirm which changes have been saved; you can also view Settings > Status to check when the last complete iCloud sync happened. In my couple of weeks testing the last beta of Bear (which didn't have several fixes included in today's App Store version), I never ran into data loss issues or other problems related to CloudKit. Alongside Markdown and a focus on power user features (more on this below), another differentiator of Bear is its rich selection of powerful import and export tools. Bear wants to be the new home for your notes, but it doesn't lock you into a proprietary system. 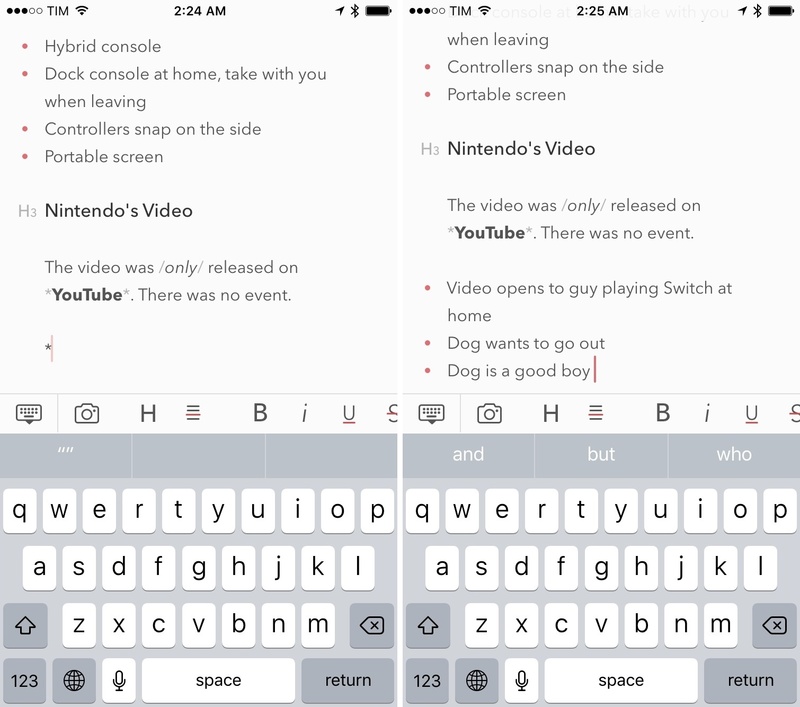 Bear has the best import and export features I've seen in an iOS note-taking app. If you want to migrate your notes to Bear, you can import an Evernote archive or text files into the Mac app; on iOS, you can pick files using document providers. You can choose to keep the original dates for imported notes, use the first line as a title (handy when importing text files from Apple Notes), or, alternatively, use the filename as a title. Bear's import and export tools. I tested Bear's import feature on my MacBook Air. After exporting from Apple Notes using this free utility, I opened the text files into Bear, and they were imported as advertised by the app. I wasn't able to test importing notes with attachments and rich text from Evernote as I no longer have an Evernote database to test against. Bear is even more impressive when it comes to getting notes out of the app. There are two ways to export notes in Bear: you can export all notes at once or export an individual note with the iOS share sheet. When exporting all notes, you can choose to merge them in a single file or export a folder with text files and attachments3; you can also decide to keep tags during the export or export text files without attachments. These formats should be enough to ensure anyone's needs can be met when moving from Bear to something else. I'm particularly intrigued by the choice of including TextBundle, a relatively new entry in this space that, among other apps, is natively supported by my favorite text editor, Ulysses for Mac and iOS. The aforementioned formats are supported as exporting options for individual notes as well. It's refreshing to see an iOS app support multiple ways of exporting notes and sending them to different apps – it's a welcome change from apps that try to keep you within their ecosystem as much as possible (this includes Apple, Evernote, and Microsoft). Personally, I've used Markdown export to send notes I want to develop into full articles to Ulysses. Also, I'm not ashamed to admit that the JPEG option is going to be great to easily tweet beautiful longform textshots from Bear (I recommend the Linky extension for that). Bear isn't a classic pay-once-and-hope-for-the-best productivity app. 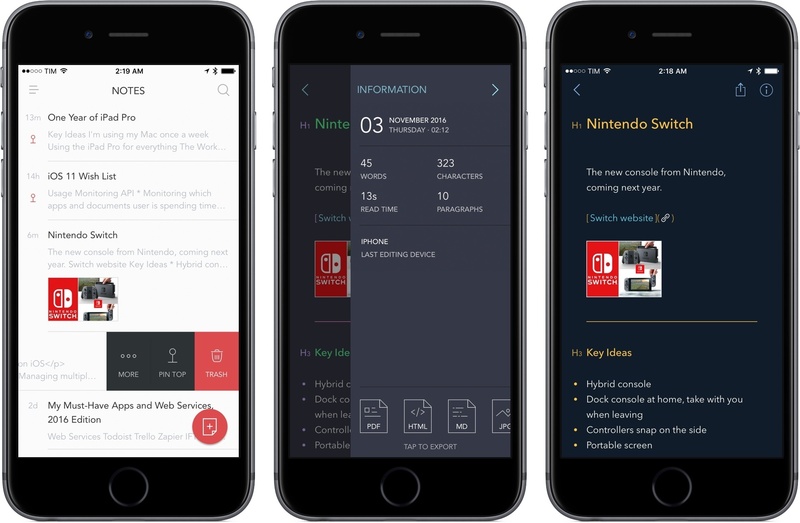 The developers at Shiny Frog are trying a subscription model for Bear: the app is free to download and there's a single subscription (which covers both the iOS and Mac app) to unlock themes, advanced exporting options4, and iCloud sync. Bear uses the new kind of auto-renewable subscriptions for all categories of apps Apple unveiled earlier this year. A Bear subscription costs $1.49/month (with a 1-week free trial) or $14.99/year (with a 1-month free trial). If you buy the annual subscription or subscribe to the monthly plan for 12 months, themes and advanced exporting options will be unlocked forever. Building a successful business on the App Store today is different from what it used to be. In recent months, we've seen the launch of App Store subscriptions and developers of pro software switching to a free-to-start model with pro features locked behind In-App Purchases – a way to entice more users to try an app, see for themselves if its feature set fits their workflow, and eventually commit to buying the full version. 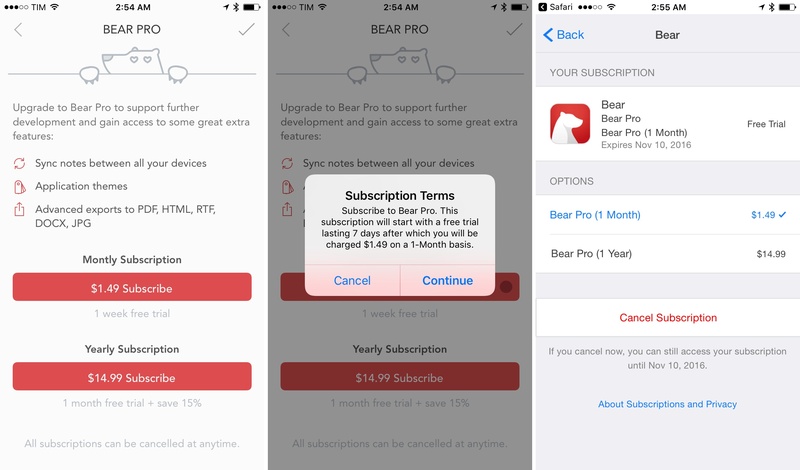 Bear's approach is interesting: the app is skewed towards pro users who demand advanced features, but the developers also believe that the frequent usage of a note-taking app – a utility you tend to use every day – warrants a recurring subscription. If Bear ends up being the app I want to use instead of Notes, and if Shiny Frog can continue to find a balance between free features and options exclusive to paying subscribers, I'd have no problem paying $15/year for an app I would use dozens of times every day. Generating ongoing revenue from loyal customers who depend on software doesn't work for everyone, but it does for a lot of services I pay for, and I'm curious to see how this will play out for Shiny Frog. If iOS devices are your primary work machines, you'll be glad to know that Bear can be automated and integrated with Workflow using x-callback-url. The developers have documented their URL scheme implementation here. There are several aspects that I like and have integrated with Workflow and Launcher widgets. I've been using the Bear URL scheme to open a private note I need to view often, but also to jump to a tag view to show a list of notes, which is faster than having to search manually in the Notes app. You can grab URLs and convert them to a Markdown version of the associated webpage in Bear; you can trigger searches from the URL scheme; you can even change the app's theme in two seconds with this Workflow widget. Changing Bear themes with Workflow. Bear follows in the great tradition of Drafts and Ulysses with a good library of URL scheme actions supported in version 1.0, and I hope that native Bear actions will be added to Workflow in the future. From an automation perspective, this is a great start. Using a simple [[Note Title]] syntax, you can create a link that takes you to another note inside Bear. Creating reference links for other notes in Bear. This is ideal to build a body of work in Bear and organize it in a single 'Table of Contents' note pinned to the top, for instance. Bear can automatically expand your TextExpander snippets, which can save you a lot of time every day. You can enable TextExpander integration in Settings > General. Want to have a slightly different version of a note in your Bear library? Swipe left on a note, select More, than tap Duplicate to create a copy. If you paste an address into a note in Bear, it'll be highlighted with a location icon. Bear makes it easy to open saved addresses, as well as preview colors. Also, if you enter a HEX color code that Bear recognizes as a color instead of a hashtag, it'll be displayed with a colored dot preview within the note. When you select some text in Bear, you can choose to copy it as Markdown, HTML, or plain text. Similarly, you can paste text from Markdown, HTML, or code. Smart copy & paste in Bear. The app even recognizes which programming language you're pasting and creates a fenced code block accordingly. That's pretty neat. 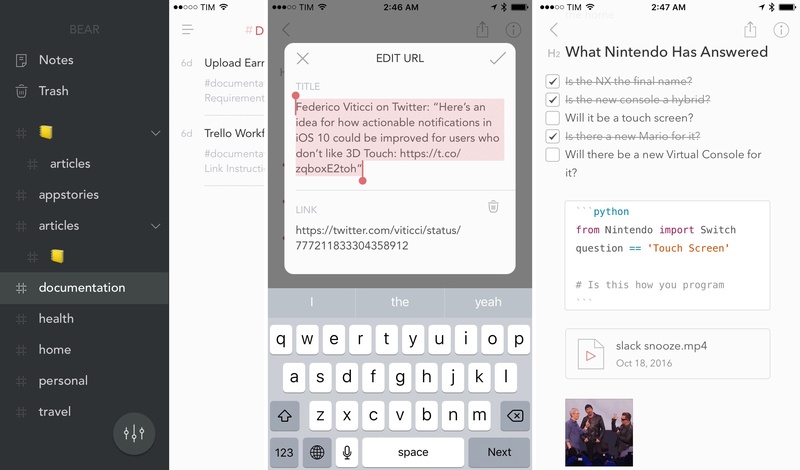 Unlike Apple Notes, Bear highlights the word you're looking for in search results. Also, search results are tag-specific – if you open a tag view and search from there, only results for that tag will be returned. 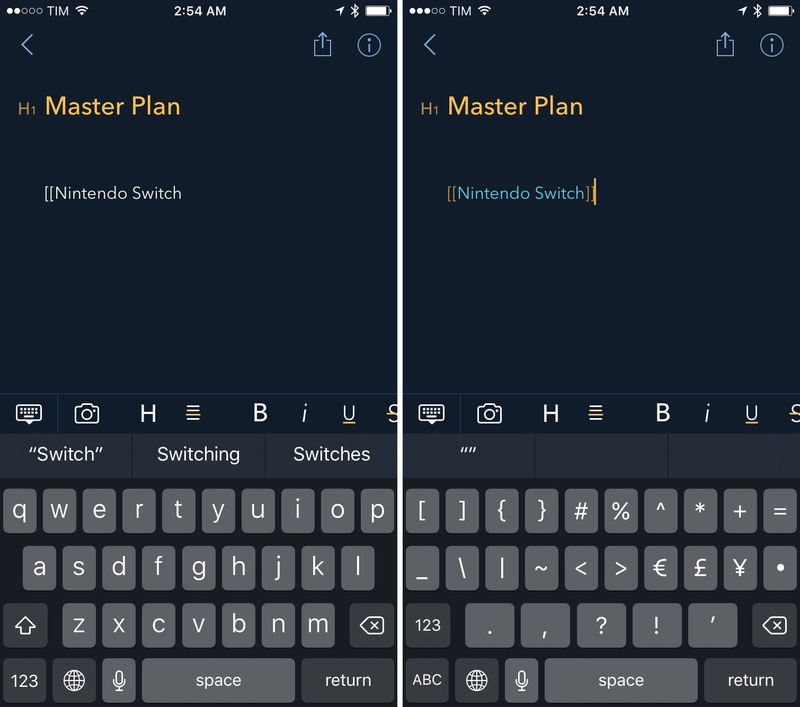 While Bear improves upon several aspects of Notes, there are some missing features, technical limitations, and design decisions that are making the switch from Apple's app harder than I imagined. With iOS 10, Apple brought collaboration to Notes using the new CloudKit Sharing API, and it's been a fantastic addition to the app. Now, whenever a friend wants to share a document with me, they can do so with the free Notes app and my iCloud email address. It's super simple, built into iOS, and reliable. Bear doesn't have any collaboration features for now. The good news, however, is that by using CloudKit, it should be fairly easy for the developers to implement the CloudKit Sharing system in a future update. If collaboration is a must-have feature for you, though, you can't use Bear yet. This is a tricky one to solve for a third-party iOS app: if you append content from the Bear extension to the same note from multiple devices, when you'll open the app you'll likely be presented with a conflicted copy of that note. Saving links and images with the Bear extension. Bear can't start an upload when a note changes because of the app's sharing extension, which leaves the developers to implement a merge feature that intelligently merges the content appended from two different devices running Bear. And Shiny Frog tells me that such merge function hasn't been built into Bear yet, which may lead to conflicted copies if Bear can't reconcile changes to the same note happened at different times on different devices. 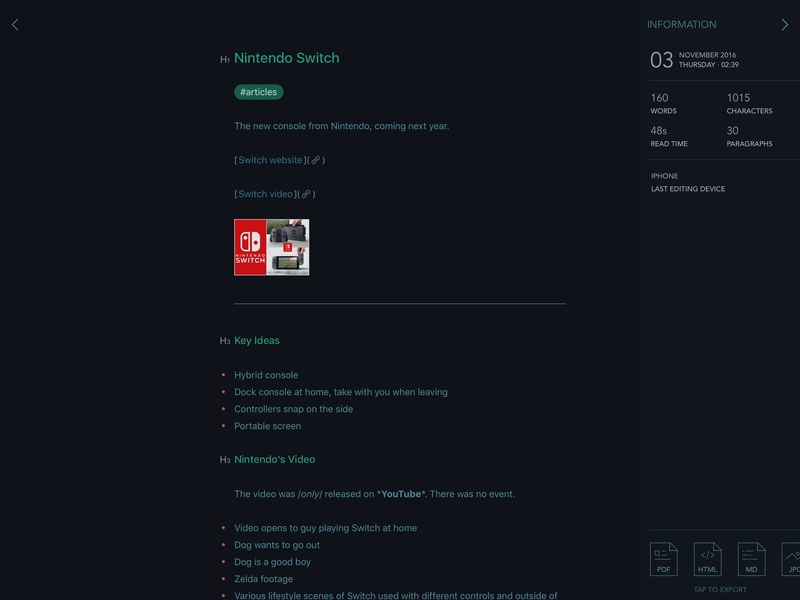 This is worse than Apple Notes, which also has an extension that can append content to existing notes, but which can merge changes to the same note without creating a conflicted copy. To overcome this limitation, I've been using the Bear URL scheme to append content to a note and launch the app afterwards (thus triggering a sync), but it's not ideal, and Notes' merge implementation is vastly superior. There are two other notable missing features from Notes: Bear doesn't display rich preview snippets for links (they only show a title with no description or image), and there's no drawing mode to create sketches. 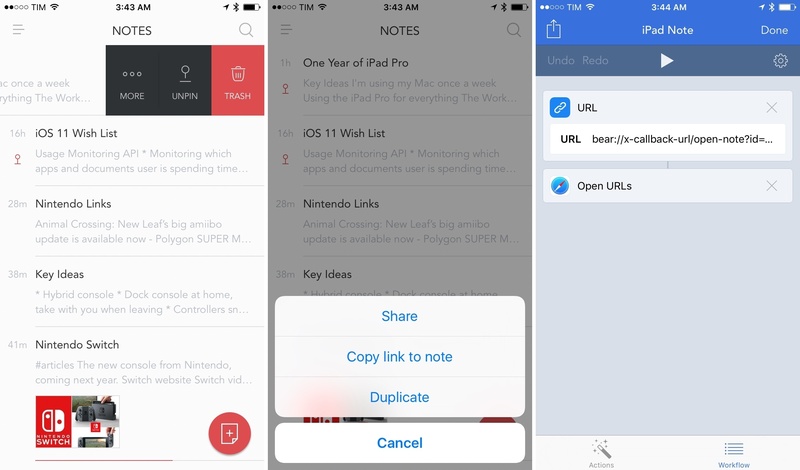 Saving links in Bear and Notes with the apps' share extensions. I can live without a sketching mode in my note-taking app (though Notes' drawing mode is extremely useful and quite the technical feat), but the lack of rich link previews is harder to accept. 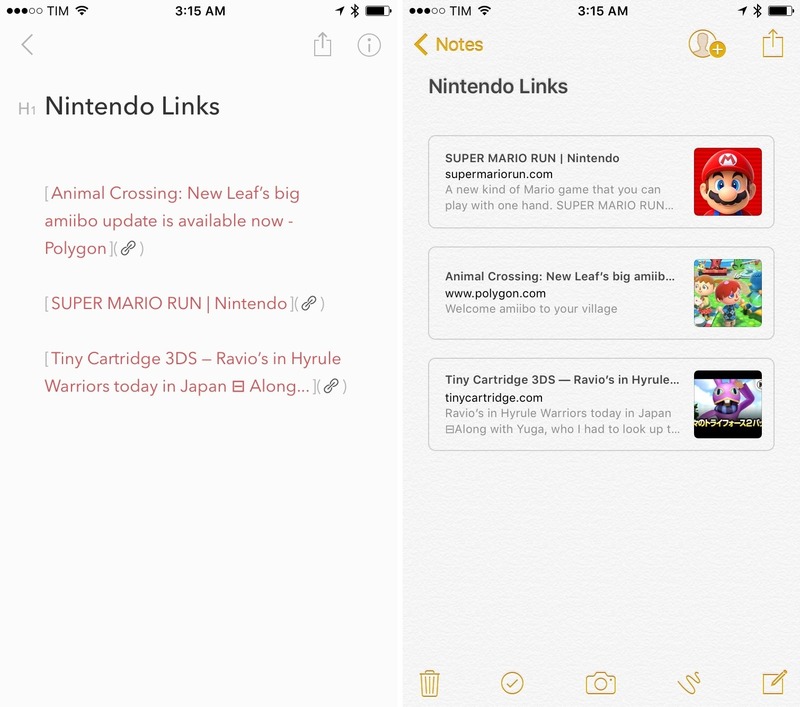 After seeing rich links in Notes and iMessage, it's difficult to go back to regular links. Bear can't lock individual notes behind Touch ID or a password. Touch ID authentication on a note-by-note basis is one of my favorite Apple Notes features, and I hope Shiny Frog will consider adding this option soon. Surprisingly, Bear doesn't feature any 3D Touch quick actions on the Home screen or support for peek and pop to preview and open notes. My reliance on 3D Touch has increased over the past year, and I would have liked to see Bear adopting the technology to speed up note creation and access to my favorite notes. 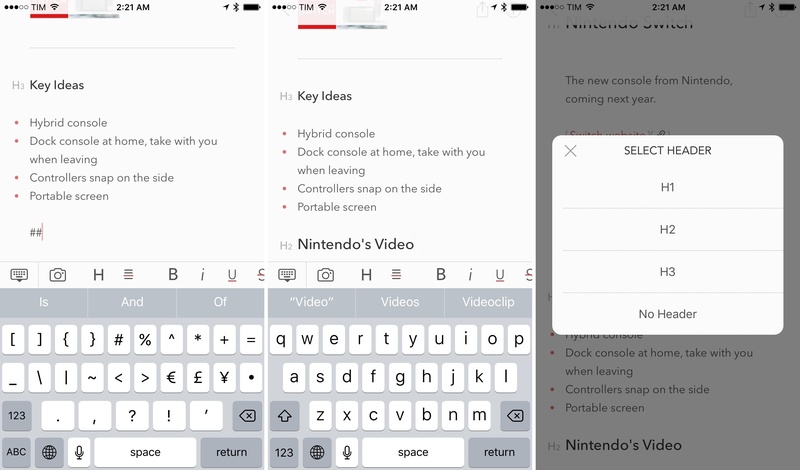 I'd especially like to see customizable Home screen quick actions to create a note, open a specific note or tag, and start a search. I came across a few bugs in the beta version of Bear I tested before launch. Embedding a video as a file picked from a document provider would often crash the app when trying to play the video. Occasionally, the copy & paste menu wouldn't appear upon tapping once in an empty text area. And, text selection – particularly when editing tags and headers – would often get stuck or scroll in an unpredictable way. I'm expecting the developers to fix these problems in the next few updates. Bear offers a great selection of advanced options, but those features can't be reordered or customized for faster access. You can't select a default export type for the share icon at the top; you can't reorder exporting options based on usage (I would like to have Markdown first); and, you can't reorder buttons in the extra keyboard row. I like it when an app caters to power users, but having dozens of options also implies having extensive customization built-in, and Bear doesn't deliver on this. Since the first beta of iOS 9 in June 2015, I have changed my daily iOS workflow to accommodate Apple Notes in both features and limitations. However, now that I've split my notes between collaborative (Trello) and personal ones, the allure of Bear's Markdown support and power user features is impossible to ignore. I haven't decided if I'm going to become an annual Bear subscriber yet, but I'm willing to pay for a few months and see how quickly Shiny Frog can iterate on version 1.0 of the app. One of the most impressive app debuts of the year. Comparisons with Apple Notes aside, Bear stands on its own as one of the most impressive app debuts of the year. 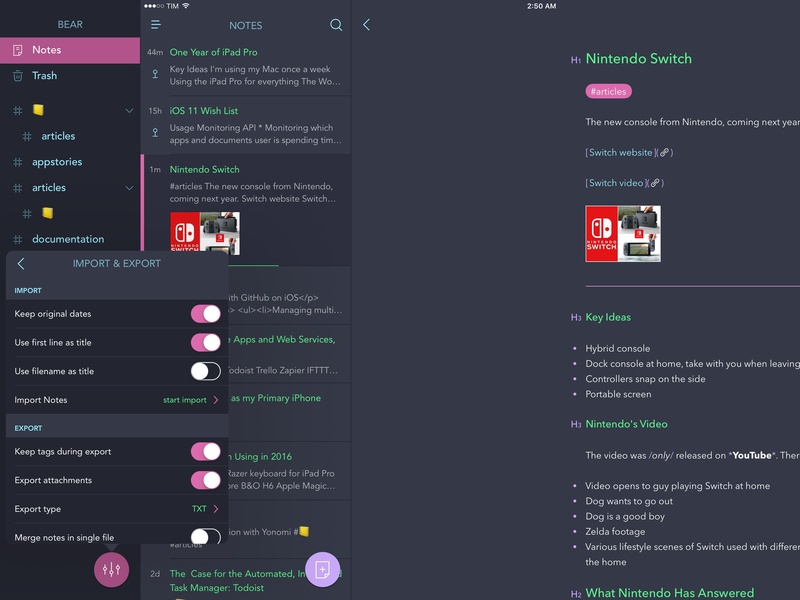 Shiny Frog has managed to build a note-taking app that tastefully balances elegance and advanced features – an app that can be used without its deeper options and still be superior to Notes in many ways, but also a power user tool that unlocks more flexibility than Apple Notes. It's great to see an indie developer like Shiny Frog can still ship a noteworthy alternative to an Apple app on both iOS and macOS. Bear is the best new competitor to Apple Notes for iOS and Mac users, and because it's a free download, I recommend taking it for a spin. I have a feeling that Bear's Markdown integration and automation features will make me save a lot of time every day.